Home HEALTH DOCTOR PROFILES Pam Petrocy, M.D. “Someone could have an acute injury from falling and start having pain, or it could be from arthritis where they have been living with the pain for a while and it is starting to impact their daily activities,” says Petrocy. Her recommendations for managing bone or joint pain depend on the cause. “For an acute injury, you may need to do ice and rest it for a while, follow with physical therapy to re-strengthen the area and get back to activity. But for chronic conditions like arthritis, you may need to start with medications and injections and go on to surgery if it becomes necessary,” she says. Injuries can happen to anyone, but there are strategies for prevention. “Try to warm up before working out and do activities that are best for keeping muscles strong, because it will help with arthritis pain,” Petrocy says. Maintaining a healthy weight can also help, particularly with the lower extremities. “Losing modest amounts of weight like 5 pounds can take 15 to 20 pounds off of your knees and hips.” After 65, women should talk to their doctors about getting a bone or DEXA scan to measure density and determine if they are at risk for a fracture. Petrocy says men over 75 also get screened because they lose some hormones and osteoporosis can still occur, just later in life. Petrocy envisioned being a general orthopedist for a long time. “When I was 12, my father had a heart attack, was brought to the hospital and underwent bypass surgery, which is what got me interested in medicine,” she says. 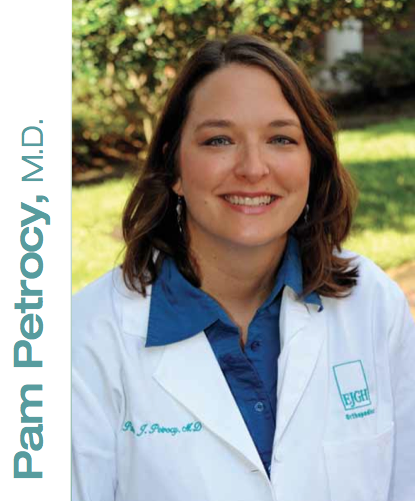 As a competitive swimmer in high school and college, Petrocy suffered a shoulder injury that furthered her interest in orthopedic medicine. “When I was going through my rotations, working with the orthopedic population was satisfying and I enjoyed it,” she says. She liked working with different ages and seeing people get better and return to a good quality of life because of treatment. Bones and joints are invaluable. “The joints are the locations where the bones come together and allow you to move,” Petrocy says. Advances have helped the field come a long way. “There are newer injections for joints for arthritis that help by improving the lubrication and contain the normal fluid from the joints,” Petrocy says. Petrocy says a lot of people overdo exercise and physical activity and end up with sprains and strains. She recommends building up slowly and if you have pain after a workout to ice down the area, rest it and not go out again until the pain is resolved. “Any time you are not better within a couple days, the pain gets worse or you cannot put weight on the extremity, it would be time to come in because it might be something more,” says Petrocy. When Petrocy is not at work, she enjoys spending time with her 14-month-old son, who is just starting to run and walk all over the place. “New Orleans is home and my husband and I want to make it home for the rest of our lives,” she says.